Theory and reality don't always match completely. One contradiction, about how a type of neurons generates signals, was now resolved by researchers at the Institute of Science and Technology (IST) Austria. Writing in Neuron, Professor Peter Jonas and first author Hua Hu (previously postdoc at IST Austria, now Associate Professor in University of Oslo) reconcile the observation that fast-spiking, parvalbumin-expressing GABAergic interneurons (PV+-BCs) send trains of rapid signals, thought to be energy expensive, with the limited energy supply reaching the brain. They show that ion channels in the neuron are tuned so, that rapid signals are energy efficient. PV+-BCs are important in higher microcircuit functions, such as pattern separation, i.e. making similar patterns of neural activity more distinct, so we can distinguish between similar experiences. Previously, Jonas and Hu showed that the fast signalling achieved by these neurons is key to fulfil these microcircuit functions. PV+-BCs neurons generate high-frequency salvos of very brief action potentials (APs), or nerve impulses. Short APs are considered energy expensive, as the fluxes of sodium (Na+) and potassium (K+) ions involved are thought to overlap in time. In an action potential, Na+- and K+-gated ion channels in the neuron open and close. Na+ channels open at the beginning of the AP, allowing Na+ to move into the axon, which causes depolarization. Repolarization of the membrane occurs when K+ channels open and K+ moves out of the axon. The AP travels down the axon towards the axon terminal, where it signals to other neurons via the synapse. The ion fluxes during APs dissipate ion gradients, and energy is needed to re-establish these gradients. During short APs such as those in PV+-BCs neurons, Na+ and K+ fluxes are thought to extensively overlap. Such ion fluxes in opposite direction do not contribute to the actual AP, but nevertheless take energy to reverse. The combination of short spikes and their high frequency in PV+-BCs neurons could pose a major challenge to the brain's energy budget. Jonas and Hu investigated how the signalling properties of PV+-BCs neurons can be reconciled with the limited energy supply to the brain. Surprisingly, this theoretical contradiction does not translate to reality. "Scientists always tend to be disappointed when theory and experiment do not match. But this project is a beautiful example that we can learn much more from mismatches than from perfect agreements", says Peter Jonas. Studying functioning neurons is the only way to obtain the desired information, and the researchers therefore used brain slices to examine the axon of firing PV+-BCs, where APs are initiated and propagate. To obtain direct information from the axon, they used a technique called subcellular patch-clamp recording, or "nanophysiology". They found that the energy required to generate the characteristic APs is only 1.6 times the theoretical minimum. Thus, APs in PV+-BCs are surprising energy efficient. How can PV+-BCs neurons be energy efficient, but still signal rapidly? Hu and Jonas found that the specialized ion channels in PV+-BCs neurons are gated to optimize both fast signalling and energy efficiency. Na+ channels in PV+-BCs axons are inactivated very rapidly, while the Kv3-type K+ channels are activated with a delay. This complementary tuning minimizes the overlap between Na+ and K+ currents during brief APs and optimizes signalling, so that it is both fast and energy efficient. "Making the model increasingly more realistic, we found that fast signalling and high energy efficiency can be reconciled. This resolves a major contradiction", Peter Jonas explains. 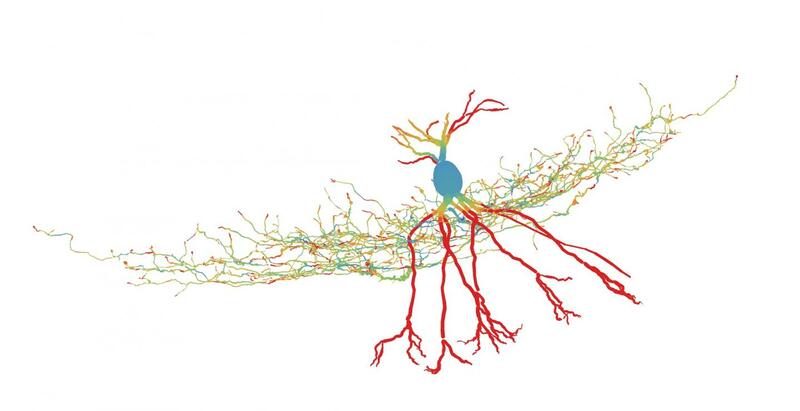 Knowledge gained from such live recordings will help to further refine models of neuronal signalling and to better understand mechanisms underlying brain diseases.